It’s a holly Jolly Christmas when you order this assortment of Sea Salted Caramels & Half Dozen Christmas Strawberries this holiday season. You’ve made your holiday shopping list and checked it twice, now it’s time to send this magnificent assortment of Sea Salted Caramels & Half Dozen Christmas Strawberries to everyone nice! Whether your loved ones are craving something juicy and sweet, or they have a taste for something slightly salty this holiday season, we’ve got you covered when you order this assortment of gourmet treats. A perfect combination of mouthwatering chocolate dipped gooey sea salted caramels and sweet, juicy red chocolate dipped strawberries, these treats make excellent last minute Christmas gifts for even the most finicky individuals on your Christmas shopping list. 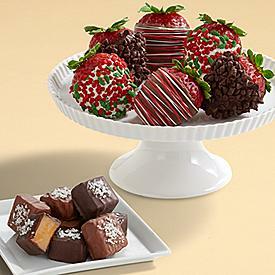 If you are searching for unique Christmas gifts for those hard to buy for loved ones this holiday season, order this assortment of Sea Salted Caramels & Half Dozen Christmas Strawberries today.